Medical malpractice is negligence committed on a patient by a doctor, surgeon, or other licensed healthcare provider during medical treatment or care. It is a highly specialized area of law with a maze of complicated rules and scientific issues. Therefore not many personal injury lawyers can handle medical malpractice cases. Attorney Alex Perkins has successfully litigated numerous medical negligence claims where a medical facility or provider deviated from the standard of care causing an unplanned or unnecessary injury or death of a patient. Medical malpractice laws are very different than a car accident or premises liability case. For starters the Statute of limitations is only two years. That is why it is very important to obtain the relevant medical records and contact the firm immediately. Before suit can even be filed there is a 90 day pre-suit period where certain procedures must be filed including a Notice of Intent and the filing of a corroborating affidavit from a doctor finding that reasonable grounds exist to support a claim. Florida also has caps on the amount of non-economic damages, the pain and suffering dollars, that can be awarded to a victim of medical negligence. For these reasons Perkins Law Offices is very selective about the medical malpractice cases the firm accepts. 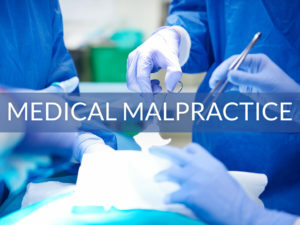 Some common examples of medical malpractice are delay or failure to diagnose, anesthesia administration errors, improper consent before a medical procedure, surgical errors, improper treatment of an illness or disease, and prescription drug errors. Medical malpractice is considered an epidemic that continues to spread in the United States today. If you or a loved one has been injured as a result of a medical error or medical negligence contact Perkins Law Offices at info@PerkinsLawOffices.com of call for a free confidential case review at 305-741-LAWS(5297).